I am delighted to be on my first visit to the City of Nottingham and your picturesque university, which lives up to its reputation as one of the most beautiful campuses in the UK. The recent film Robin Hood has been a big hit with audiences both in China and here in the UK. The story as I am sure you know, is about a man who robbed from the rich to give to the poor, while living in Sherwood Forest on the outskirts of Nottingham. But it has been as much about the stunning natural beauty and rich British culture depicted in the film, which has fascinated a lot of Chinese viewers. I believe this is great news for you, as Nottingham should expect to receive more visitors from China, and University of Nottingham will be home to more Chinese Students. Founded in 1881, the University of Nottingham is amongst the top 10 institutions of higher learning in the UK. People won’t forget that in 2003 alone, two Nobel Prize winners were Nottingham graduates. Apart from its intellectual excellence, the University of Nottingham is also famous in China for its close ties and cooperation with my country. Over 1,300 Chinese students currently studying at its UK campuses. Even more importantly, with the setting up of the Ningbo campus in 2004, Nottingham became the first foreign university to establish an independent campus in China. There are other factors as well. 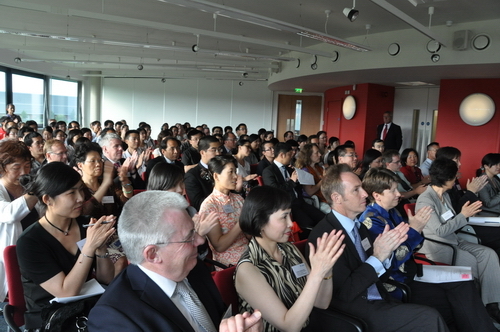 The School of Contemporary Chinese Studies is a leading institution of China studies in Britain. The Confucius Institute jointly run by the University of Nottingham and Fudan University has been doing well. 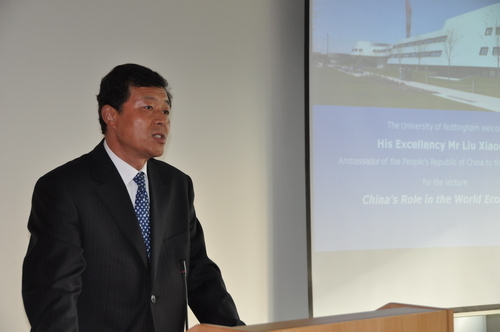 All this has been achieved through the hard work of many, not least your Chancellor – Professor Yang Fujia. Firstly, China has become an important driver for the world economy and trade. Over the 32 years of reform and opening-up, China’s GDP has grown from 260 billion US dollars in 1978 to 4.9 trillion, an average annual growth rate of about 10%. And as its GDP grows, so China’s contribution to the world economy also increases. In 1978, China contributed 0.1 percentage point or 2.3% to global economic growth, but by 2007, these figures had jumped to 0.7 percentage point and 19.2%, making China the biggest contributor among all countries. In 2008 and 2009 when many developed countries slid into recession, China continued to grow at 9% and 8.7% respectively, contributing still more to the world economy. And as World Bank Vice President Justin Yifu Lin has estimated, the global economy will grow by 2.7% this year and 30% of that growth will come from China if it sustains an 8% growth rate. In 1978, China’s trade was 20.6 billion US dollars or 0.8% of the world’s total, these figures had grown in 2008 to 2.56 trillion and 7.9%. However, as a result of the financial crisis, China’s trade dropped to 2.2 trillion US dollars in 2009, although accounting for 9% of that year’s world total, making China the world’s largest exporter and second largest importer. According to the World Trade Report 2009 by the World Trade Organisation (WTO), China is becoming the engine driving trade growth globally. Secondly, China is a reliable partner in times of crisis. During the 1997 Asian financial crisis, many were expecting the RMB to depreciate or the Chinese economy would be ruined. China decided to keep the value of the RMB as it was. This decision put China under huge pressure for which it has paid a price. It did however help to uphold the financial and economic stability and development in Asia and the world. In 2008 when the international financial crisis broke out, China made timely adjustments to its macroeconomic policy, quickly putting together a stimulus package aimed at expanding domestic demands and stimulating economic growth. China also called on countries to weather the storm together. We strengthened macro policy coordination with other leading economies and took an active part in the G20 summits. China called for free trade and intensified business cooperation bilaterally, regionally and multilaterally, through sending buying missions overseas, among others. China also committed itself to buying up to 50 billion US dollars in International Monetary Fund (IMF) bonds. During the recent European sovereign debt crisis, China stood firmly behind the Euro Zone and the IMF as they worked together to launch an aid plan, by not selling its Euro assets. And during a recent visit to Greece, the Chinese Vice Premier Zhang Dejiang took with him 14 much-needed agreements worth nearly 10 billion Euros. These ranged from the construction of bulk cargo ships, airport facilities, a logistic hub and an ocean park, to the purchase of olive oil. This month has also seen China signing a bilateral currency swap agreement with Iceland, worth about 500 million US dollars to facilitate bilateral trade and to help with the economic recovery of Iceland. Just a week ago, China announced further steps to reform the RMB exchange rate regime and enhance the RMB’s exchange rate flexibility, as the world economy improves and China’s economic recovery is on a solid footing. Thirdly, China stands for the reform of the international financial system. The recent financial crisis has laid bare many deficiencies in the international financial system. China supports the G20 summit’s role as a major and effective platform for international efforts to tackle the financial crisis and step up economic cooperation. President Hu Jintao proposed, at the Washington G20 summit in 2008, an all-round, balanced, incremental and result-oriented approach to move the reforms in a more equitable, inclusive and well-managed direction. At more recent summits in London, Pittsburgh and last weekend in Toronto, China called for the speeding up of reform to the international financial institutions (IFIs) and for tougher financial regulation. China has worked for more agreement among the emerging markets and developing countries on the reforms to increase the representation for developing countries in the IFI’s. China calls for the improvement of the international monetary system and the reserve currency issuing regime, along with the stabilisation of the exchange rates of major reserve currencies. Fourth, China leads international efforts for a green and low-carbon economy. The Chinese government places high importance on growing the green economy and addressing climate challenges based on our national conditions and also drawing upon international experience on sustainable development. We have given priority to building an energy-conserving and environment-friendly society, and we are making energy conservation and emissions control part of our mandatory economic and social development targets. We are pledging as part of our National Climate Change Program, to cut energy intensity by 40-45% by 2020 against the 2005 level. China is also developing its hydro, nuclear, solar and wind power generation schemes in a massive scale. And we expect to increase the proportion of non-fossil fuels in primary energy consumption to around 15% by 2020. We have also proposed to increase forest coverage by 40 million hectares or approximately 1.6 times the size of Britain by 2020 against 2005 levels. Any understanding of the nature of China’s economic development would not be complete without a look at the other side of the story. All the economic figures I have outlined will be much less impressive once they are divided by our 1.3 billion population. For instance, China’s per capita GDP in 2009 was only 3,600 US dollars, ranking behind Albania to be the 100th in the world; its per capita trade value stood at 1,600 US dollars, much lower than the world average of 3,700 US dollars, and one fifth of that of Britain. Out of the 1.3 billion people in China, 700 million live in the poor countryside; with 150 million living under 1 dollar a day, the poverty line set by UN. China also faces the huge challenge of serious income disparity between regions and between urban and rural areas. This is the fact we face: China is both big and small, strong and weak; it is developing and this process is going to be long and tortuous. China’s development is in the interest of the UK. Thanks to the efforts of both our sides, our business cooperation has made much progress in recent years. The UK is China’s third largest trade partner, the largest investor and a leading investment destination in the EU. China is the second largest trade partner of the UK outside the EU and despite a drop in our trade in 2009 due to the crisis, trade in goods has quickly picked up in the first 4 months of this year, hitting 13.81 billion US dollars, an increase of 29.8%. Firstly, further tap the potential for cooperation. Both sides need to identify major projects where cooperation may be possible. For example, China is working on the “Jumbo Jet” project while the UK is planning to build a high-speed railway linking its north and south. While the UK is a frontrunner as a low-carbon economy which possesses mature new energy and environmental technologies, its market is not big enough. China is embarking on a new way of industrialisation that conserves energy and properly controls emission. The vast Chinese market is exactly where the UK can put its scientific achievements and knowledge to good use. Secondly, expand cooperation at all levels. With SME’s accounting for over 99% of all businesses in China and Britain, and contributing over half of our total GDP, they are therefore key to the success of future growth between us. British SMEs being generally well-run and known for their productivity, advanced technology and innovation, while in recent years we have seen a rise in the number of technology-based SMEs in China. These tend to be labour-intensive, but highly responsive to market demands. The two sides need to work harder to help and support SMEs, by removing obstacles such as language and lack of information, to translate our mutual needs into effective cooperation. Thirdly, improve the environment for cooperation. We need to foster a market environment that facilitates technology transfer through better protection for Intellectual Property Rights (IPR), to ensure companies are confident when sharing their latest and best technologies. We also need to provide better financial services to support trade, especially by lending more and providing businesses with more financial support. I am happy to see that the new British government is committed to closer engagement with China. President Hu and Prime Minster Cameron had a good meeting in Toronto the day before yesterday, coming to agreement on a number of important issues, which is crucial to continued development of our relations. Just as President Hu stressed in his meeting with Prime Minister Cameron that “China sees the UK as an important global partner”, “the two countries share extensive common interests in facilitating global recovery and meeting global challenges. This requires us to take a long-term and strategic view when making plans for our relations, so that we can ensure that our cooperation will better serve our people.” The ongoing World Expo has significantly boosted our business, financial and cultural cooperation and has enhanced the mutual understanding of our peoples. It is fair to say that our relationships are off to a good start, all we need to do now is to step on the accelerator. As Charles Dickens wrote in Great Expectations, “I find the truth to be that an opening won’t come to one, but one must go to it”. Let us work together, find the openings, seize the opportunities and move forward our business cooperation, bilateral relations and friendship.